Description: Why buy new when this home is situated next to open space with mountain views, has been upgraded and has it all! Gourmet granite counter-tops in kitchen featuring stainless appliances including gas cooktop, refrigerator, double ovens and microwave. This home features extended hardwood floors, study, high baseboards, bump out in family room, slate bath counters, closet built-ins, a bonus room that could be used as a 4th bedroom on main level, 20k in landscaping including drip system and flagstone patio, two ac and furnaces, three car tandem garage and a fully excavated basement with 9' ceilings. Home sides open space which will not be built on. New boulder school being built in neighborhood. 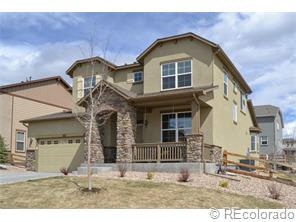 This flatiron meadows home won't last!